Gone are the days of large-scale manufacturing and the adoption of a one-size-fits-all approach to retailing. 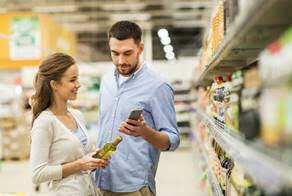 The key to retail growth in the FMCG industry is personalisation. Possessing a more in-depth understanding of what, when and where consumers are buying, and providing a more personalised experience with a range of products to suit is key. Sports brands offer a particularly good example of how the FMCG industry has embraced this growing trend of personalisation. Taking the personalisation process to another level is Adidas’s robotic ‘Speedfactory’ located in Germany. This heritage sports brand is now able to manufacture small runs of unique ‘AM4’ athlete-data driven designed training shoes that are adapted for different city terrains throughout the world. Other leading brands such as Nike offers customised footwear, in a wide range of colours, materials and personalised initialling. Another category that makes huge efforts to create a personal connection with shoppers is Food and Drink, offering customisable gifts in everything from chocolate to premium fizz. Ferrero’s Nutella allow shoppers to adorn their favourite jars of chocolate spread with personal greetings or individual names in place of the usual headline branding. This kickstarted a trend with the likes of Toblerone, Reese’s and Coca-Cola’s ‘Share a Coke’ campaign joining in. One company, Candy Mechanics, even offers 3D chocolate-printed ‘Lolpops’ of your face on a stick. Luxury brands, such as Veuve Cliquot Champagne, has enhanced the overall buying experience by allowing shoppers to personalise bottles with a location and its distance to its manufacturing site in Reims. Such personalisation offers a great way to connect and nurture shopper loyalty with GenZ consumers, particularly for global products. Personalising products is one thing but the challenge for retailers is often to find a way to make the shopper feel understood and special. Geo-marketing, which uses geographic information to improve the chances of a message reaching a certain customer at the right time, has proved effective and is often considered to be the starting point for personalisation. Equipped with the right data, retailers, whether located in residential areas, urban centres with offices or business areas, can ensure they are more attuned to the needs of their customers by offering popular ranges of products that are more frequently bought, and that the personality of an individual store’s location is reflected in its product line. When it comes to providing consumers with tailored product offerings and improved instore experiences, both manufacturers and retailers can learn from local shops and have the advantage of having a larger retail space in which to operate in. Following the growth of out of home breakfasts in France, a good example of this could be for manufacturers to work more closely with retailers to create a branded breakfast area, thereby offering something unique and different to the consumer. In France, IRI 360° works with a fintech company to track spending across 350,000 people. What this data reveals is that spending in supermarkets and hypermarkets declined from 16.3% in 2016, 15.8% in 2017 and down to 15.4% in 2018 (versus total spent). Whilst the mass-market is struggling, there is plenty of growth in specific areas as consumers look to break out beyond the standard offering to find more unique or specialist products and brands. For example, IRI studies from 2016 to 2018 revealed a strong correlation between store performance and the availability of organic products. Organic food is a growing sector in France and in 2018 reached a market penetration of 26%, an increase of 4.5% in the number of customers year-on-year. Because the consumption patterns of organic food vary across the region, organic produce has become a key personalisation driver and offers the opportunity to identify those individual geographic regions with the highest consumption rates. Armed with this type of consumer data, regional stores can ensure adequate supply in areas where organic food is a significant part of the weekly shop, or whether it simply becomes an extension of existing categories in regions where organic is less of a destination driver. IRI’s latest European Shopper Survey, reveals that local products and ethical and sustainable practices are another way for retailers and manufacturers to work together and meet local consumer needs. The survey showed that over 70% of European shoppers identify strongly with ethical practices, including brands that respect the environment and use environmentally friendly packaging. They also have a clear preference for buying locally-produced with minimal or zero food miles. European retailers have responded to this trend and are championing local producers to meet a growing demand for artisan produce. For example, Dutch supermarket chain Albert Heijn has expanded its AH Startup Shelf initiative, allowing start-ups to showcase their produce in selected stores. In the UK, Morrisons launched the Local Foodmakers initiative following direct customer feedback for more British products and food to be sourced closer to home. In doing so, this initiative aims to provide support for local farmers, delivers fresher produce and cuts food miles. Personalisation allows a more in-depth understanding of consumer behaviour, helps retailers reveal important buying trends and provide a greater understanding of the regional characteristics of stores in different neighbourhoods that serve a diverse range of consumers. Manufacturers and retailers need to collaborate on big data to really understand who they are targeting and where, and then work on experience to make themselves a destination rather than a bystander. Supplier collaboration: a marriage of convenience or a path to retail growth?